The H-700 Hard Hat Series is engineered to provide full-shift comfort, head protection, balance and stability. 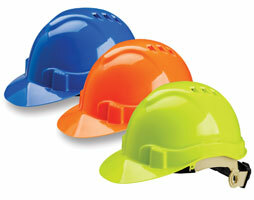 The lightweight hard hats feature unique top-of-hat designs with short brims in both vented and non-vented versions. 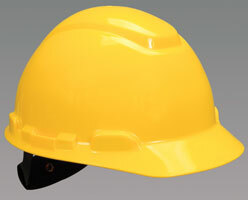 These hard hats are made from high-density polyethylene and meet the requirements of ANSI/ISEA Z89.1 – 2009 Type I, class C, G and E.
Electrical workers are sometimes exposed to sudden releases of energy that occuFaceGuard Arc Shield FS-20ARC10 provides r during an electrical arc. The 12 cal/cm² face protection against an electric arc flash hazard. The shield is impact-resistant and tolerates heat to 265° F. It also provides 99 percent UV protection and has an anti-fog coating. The Roughneck P2A Protective Cap combines advanced design with a proprietary fiberglass compound. Heat-resistant to 370° F, the lightweight Roughneck P2A also features the SuperEight custom-fit eight-point suspension for ultimate balance, stability and impact protection. On impact, the SuperEight Impact Energy Control System dissipates force by reducing it to smaller increments and spreading it over a greater area. 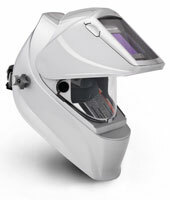 The VIKING 3350 Series auto-darkening welding helmet offers top-quality LCD optics for a clear, natural view in varied ambient light settings. The solar-powered helmet, augmented with a user-replaceable lithium battery, includes additional inside and outside cover lenses, a bandana, and a helmet bag. The VIKING 3350 Series helmet comes in standard black and four additional graphic styles. 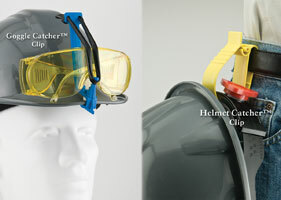 The Helmet Catcher is a versatile “catch-all” clip that can be used to keep tools or other personal protective equipment secured. It is available in a variety of colors. The Goggle Catcher clip is easy to install and keeps goggles, safety glasses or sunglasses firmly attached to a hard hat so they are available when needed. The Serpent Ventilated Safety Helmet helps minimize heat buildup under the shell of the helmet while offering optimal head-injury protection. Its CoolSense airflow system, along with six vents along the peak of the helmet, promotes the release of heat and keeps workers cool. 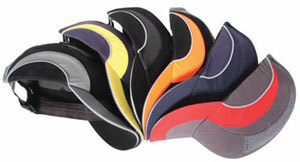 A comfortable, cushioned brow pad absorbs moisture and perspiration, promoting worker compliance. Designed for repetitive, long-term industrial use, the Titanium 9400i offers the ultimate in versatility with an integrated grinding shield, durable shock-absorbing gasket and aluminum heat shield. 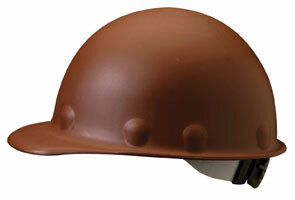 The helmet features a convenient quick release that provides easy access for front cover lens changes. It meets the ANSI Z87.1-2003 high-impact standard. Designed as a safeguard against accidental bumping or scraping of the head, the sporty baseball style of the HardCap A1+ helps increase wearer acceptability and reduce injuries. The cap is fully adjustable for a perfect fit and features an inner high-density polyethylene liner with foam cushioning. It also is available with a reduced brim for better vision when looking up. 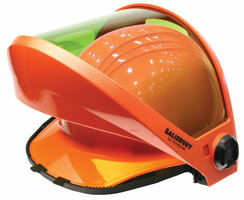 The AS1200U weight-balancing arc flash protection faceshield fits all popular front-brim hard hats. The shield easily stows in a balanced, compact position and centers over the top of a front-brim hard hat when not needed. 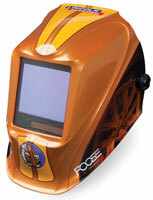 It provides excellent peripheral vision and features a fog-reduction coating. It has been tested to ASTM F2178 specifications. Exclusive impact and heat-resistant polycarbonate construction makes the Double Matrix faceshield the lightest-weight faceshield available today. 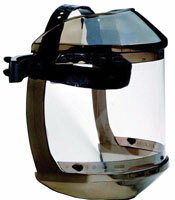 It has a translucent crown for maximum range of view and ratchet suspension for easy adjustment and a secure fit. Comfortable, complete coverage for the face and neck is molded from high-strength polycarbonate material, and is made to withstand rugged use. The Bionic Shield is perfect for workers exposed to falling or flying objects, impacts, chemical splashes, and airborne debris. With 2,784 possible positions, this highly adjustable headgear can be tilted closer or farther from the face, depending on preference and application. 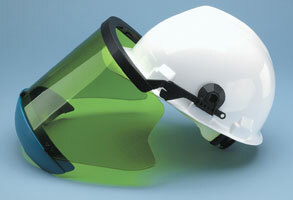 A replaceable visor with dual position choices features excellent optics for increased visibility. The Jackson Safety W60 TrueSight auto-darkening filter for welders offers one-touch mode adjustment, intuitive digital controls and improved visibility. It features a built-in magnifying lens holder; adjustable settings for shade, sensitivity and delay; and an automatic on/off feature that turns the lens off two hours after the last arc.